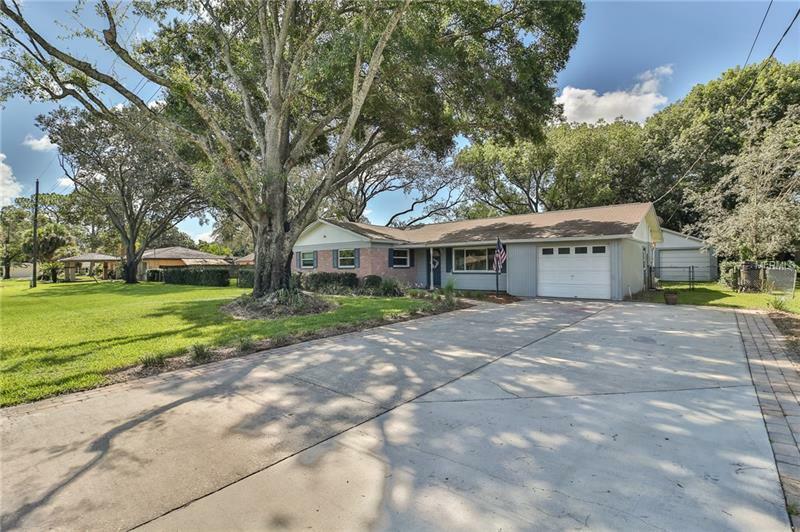 Immaculate 4 bedroom Carrollwood area home on over a 1/2 acre lot! This home features an attached 1 car garage, detached 1.5 car garage, and in 2017 installed a steel building. Brand new HVAC system, Fresh interior paint, well pump, tank, and motor replaced in 2016, new water softener 2017, new dual pane windows throughout the home in 2016, updated guest bathroom, stainless steel appliances with gas range 2016. Polished terrazzo flooring throughout with brand new laminate in the Family/Florida room and 4th bedroom. Formal Living Room, Dining Room, Family Room, and walk in closet in the Master Bedroom. Completely fenced in and exceptional yard that is over 1/2 an acre with big beautiful oak trees and an amazing private space with fire pit behind the home. It is truly rare to find a home with this much land and privacy at this price so conveniently located to Carrollwood and all that it has to offer! Seller will include the zero turn riding mower with a full price contract. Lawn treatment with Massey paid through next March.